American Airlines recently found a novel relatively free way to tap into the genius down at SXSW in Austin. 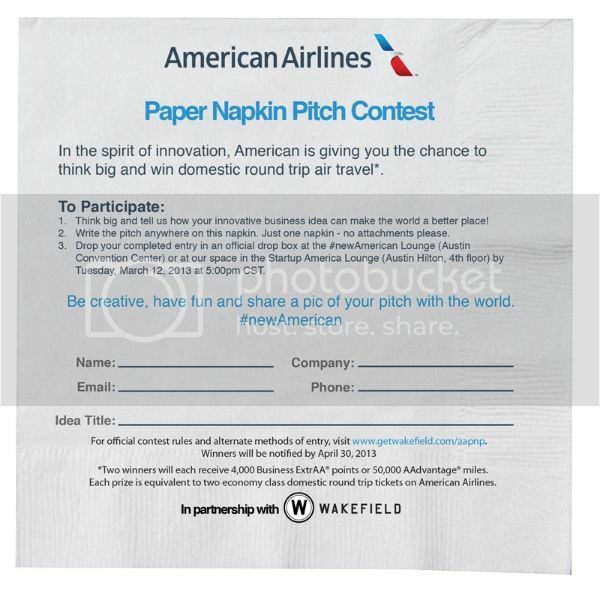 Partnering with start-up community, Wakefield, the airline created the American Airlines Paper Napkin Pitch Contest, which runs until March 12th and asks passengers to drop a napkin with their most creative ideas for AA into boxes located at the #newAmerican lounge at SXSW. In addition to getting their idea seen by a panel of experts, the winner will get 4,000 American Airlines Business ExtrAA points that can be used for domestic travel.